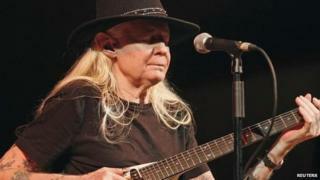 Blues guitarist Johnny Winter, known for his energetic solo performances, has died at the age of 70. Winter - hailed as one of the 100 greatest guitarists of all time - rose to fame in the 1970s, including memorable collaborations with his mentor Muddy Waters. He passed away in Zurich earlier this week, just days after playing at the Lovely Days Festival in Austria. He recently said he just wanted to be remembered as "a good blues musician". The Texas star said he knew he wanted to be a musician from the age of 12. He began his musical career on the clarinet, and then the ukulele, before moving on to the guitar. His breakthrough came in 1968, at the age of 24, after opening for Mike Bloomfield. It saw him singled out by Rolling Stone as one of the best blues guitarists on the Texas scene. The surge of interest in his career sparked a bidding war, with Columbia Records eventually offering him a substantial contract. Winter, who was instantly recognisable by his long white hair, worked with some of the greatest bluesmen, producing several albums for his childhood hero Waters - with whom he won a number of Grammys. He paid homage to Waters on Tribute to Muddy, from his 1969 release The Progressive Blues Experiment. Other classic blues hits included Rollin' and Tumblin, Bad Luck and Trouble and Good Morning, Little Schoolgirl. He also played with Jimi Hendrix and Janis Joplin, who reportedly became his lover. In 1976, he teamed up with his brother Edgar Winter, a fellow musician, for the live album Together. A statement from his wife, family and bandmates said they were all saddened by the loss of one of the world's finest guitarists. He was due to release a new album entitled Step Back on 2 September.